Spanish Prime Minister Jose Maria Aznar says all possible angles will be investigated to catch those responsible for the Madrid bomb blasts. At least 198 people died and 1,400 were wounded in the bomb attacks on commuter trains on Thursday morning. "No line of investigation will be ruled out," Mr Aznar said, just before Spaniards held a five-minute silence. Clues found so far seem to implicate either the militant Basque separatist group Eta or Islamic radicals. The BBC's Danny Wood in Madrid says the deathtoll is set to rise, as hospital staff are trying to save the lives of more than 100 people with serious injuries. Spain is observing three days of official mourning for those who died in bombings, the worst in Europe for 15 years. Flags are at half-mast and schools and other public institutions have closed. Political parties have halted campaigning for Sunday's general election. 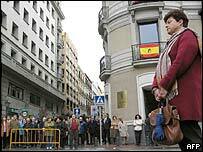 Cities across Spain came to a standstill at midday to mark an official period of silence for the victims. Large demonstrations against terrorism are planned for Friday evening and vigils and protests have already been held all over Spain, including in the city of Bilbao in the Basque heartland. The Italian and French prime ministers, Silvio Berlusconi and Jean-Pierre Raffarin, and EU chief Romano Prodi are flying in to attend the rallies, which will begin at 1900 local time (1800GMT). Italy - a supporter of the US-led war in Iraq along with Spain - has increased security in case the attacks were linked to opponents of the invasion. France has also raised its own security level and Portugal has boosted checks along its border with Spain. Spanish Foreign Minister Ana Palacio earlier said everything appeared to implicate Eta in the attacks, with "very strong clues" and "very strong precedents" backing that view. 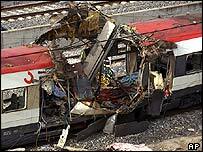 The group has previously targeted the Spanish railway system and two Eta suspects were arrested last month driving a truck loaded with more than 500kg of explosives headed for Madrid. But on Thursday the interior minister said a stolen van had been found near the route of the trains containing detonators and a recording of Koranic verses - possibly indicating Islamic militant involvement. A message purportedly from the Abu Hafs al-Masri Brigades was also sent to a UK-based Arabic newspaper saying it had attacked "America's ally in its war against Islam" on behalf of al-Qaeda. Spanish editorial writers are demanding answers before voters go to the polls, because the culprits' identity might influence people's choice of party. The ruling Popular Party campaigned on a hardline stance against Eta, but it also defied popular opposition by supporting the US-led war against Iraq - which may have triggered an attack by al-Qaeda. Mr Aznar, who survived an Eta car bombing in 1995, is due to step down after a new government is formed. He said no fanatical minority - whether religious or ethnic - that was driven by murderous impulses would be allowed to threaten Spain's democracy. Thursday's attack was the worst act of terrorism in modern Spanish history and the deadliest in Europe since the Lockerbie airliner bomb killed 270 in 1988. Mr Aznar told the news conference that 14 people of 10 different nationalities were killed other than Spaniards, most of them from countries in Latin America. The task of identifying dozens of bodies is continuing more than 24 hours after the blasts. Forty experts have been drafted in and there has been a steady stream of grieving relatives at a large convention centre that is being used to house the dead. At midday much of the country came to a standstill as millions solemnly observed a five-minute period of silence. Sobbing passengers on Madrid's transport system have been lighting candles and leaving flowers at Atocha station and near the scenes of the other blasts. "I saw the trains and I burst into tears. I felt so helpless, felt such anger," said one passenger, Isabel Galan, after her train had passed the mangled remains of the stricken wrecks. Spanish TV stations have included a small red and yellow Spanish flag with a black sash in the corner of the screen. Hundreds of thousands of people are expected to join this evening's rallies in Madrid and across the country. "The focus has shifted towards al-Qaeda"